Screening mammography, an important part of breast cancer diagnosis. Remember when the revised US Preventative Service Task Force (USPSTF) recommendations for breast cancer screening were released in November 2009? Like the recent FDA White Paper and Advisory Statement on Anaplastic Large Cell Lymphoma (ALCL) in women with breast implants, the USPSTF caused quite a stir. 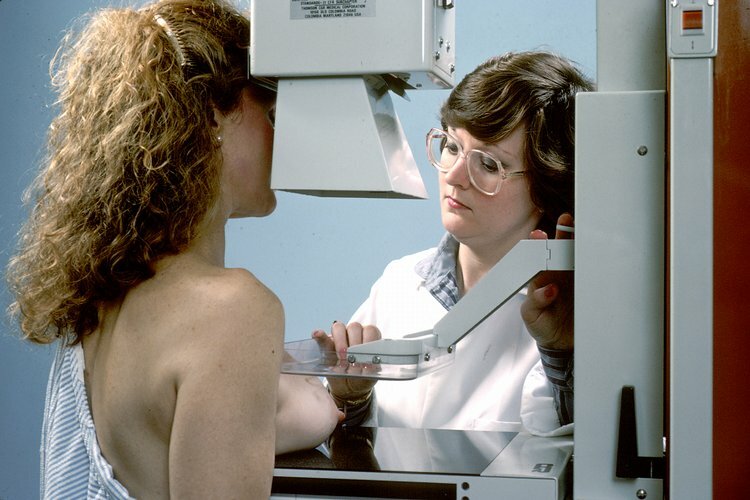 A the heart of the controversy was the USPSTF’s advice against the long time recommendation for routine screening mammograms for women beginning at age 40. The USPSTF recommended delaying routine screening until age 50. Immediately, cash strapped county health organizations and large HMO organizations alike, debated cutting dollars to fund screening mammograms for women under 50. Meanwhile, a large number of US health care organizations, including the American Society of Plastic Surgeons (ASPS), the American Cancer Society (ACS), the American College of Radiology (ACR), and the American College of Obstetricians and Gynecologists (ACOG), recommended that physicians and patients continue to follow earlier guidelines. They recommended to continue screening mammography for patients aged 40 to 49, despite the government committee’s recommendation to start at age 50. The recommendation to continue screening at 40 was based on all previous studies showing a benefit to finding early breast cancer. Two years later, the advice to continue screening mammograms at age 40 seems to have been right on the mark. I don’t think this comes as a surprise to anyone who cares for women with breast cancer; however, a study published in the American Journal of Radiology, which analyzed the same data as the USPSTF concurs with the earlier guidelines. According to the analysis, women who receive annual mammograms starting at age 40 can significantly reduce the risk of dying from breast cancer by 71 percent. This is in stark contrast to women who follow the USPSTF recommendations, who had only a 23.2-percent reduction in mortality. The lesson here is not that government is bad, but that science is good. The practice of medicine is based on the odds of something helping more than it hurts. While studies may at times seem to offer conflicting advice, carefully analyzing the details can often resolve the issue. In this case, the data used in the USPSTF study was used to prove the point. So ladies, if you are 40, it is time to get your mammogram. The best scientific tool we have is the prospective, randomized, controlled, blinded study. But what does that mean? Prospective: the study is planned before the data is collected. In this way, data known to be conflicting can be accounted for, and will be less likely to distort the results. The opposite of a prospective study is a retrospective study, where data from the past, often not collected in the best way possible, is used to evaluate a treatment plan. Randomized: patients are randomly selected to enter the treatment groups. This is very important. This allows for equity in the treated and untreated groups. For example, patients with a family history of breast cancer tend to have a higher incidence of breast cancer. If all patients with a family history of breast cancer elected to have early mammograms, as one would expect them to, the incidence of breast cancer would be higher in the group that received early mammograms. Without additional information, it would be assumed that mammograms caused more breast cancer. This would not be true, but the data would support it, because of the way the study was designed. If patients are randomly assigned to the early and late mammogram groups, patients with a family history would be randomly (evenly) distributed between the two groups. The net effect would be the same expected incidence of breast cancer in both groups. In a randomized study, if the group with early mammograms had more breast cancer, it would indicate that the mammograms may be causing the problem. This is not what randomized studies show. We know that mammograms require radiation, and radiation can cause cancer; however, for all studies done, mammograms find and cure more breast cancer than they cause for women over 40. Controlled: A control group is a group that is compared to treatment under study. If you have a new treatment, and you want to prove that is provides a benefit, you need to compare a group of patients receiving the new treatment to a group receiving the current treatment. The current treatment group serves as the control group. Comparing a new treatment to no treatment, may show that the new treatment is better than nothing, but it will not prove that is better than the currently accepted treatment without the head-to-head comparison. Blinded: Blinded studies are designed so that the patients do not know which treatment they are receiving. Sometimes the doctors and health professional conducting the study are kept in the dark too. This is to prevent investigator bias, and to help randomize the placebo effect. 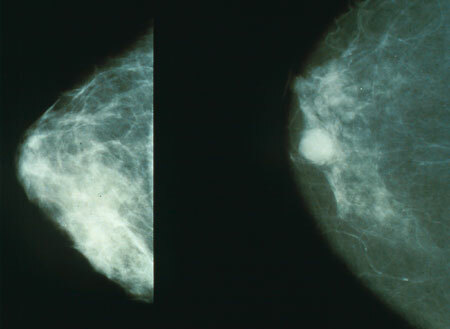 The mammogram on left is of normal glandular breast tissue. The white circle in the mammogram on the right is breast cancer. Prospective: Before the study is started, protocol is established. This would include who would be studied (women age 40) and what conditions would be excluded (men, women who already have breast cancer, women with other severe health problems). The number of women needed to prove statistical significance. Reasons for dropping out, and how to handle the data collected for those dropping out. It might be good to estimate the number expected to drop out, so that the remaining groups could still show statistical significance. Randomized: How women are selected to be in each group. Toss of a coin, even or odd days of birth, anything unrelated to the mammograms or breast cancer, so that the two groups will be as equal as possible in all the variables that are not being controlled. Controlled: A definition of the control group is established. In this case, the control group needs to be matched for age, family history of breast cancer, smoking, weight and all other variables known to contribute to breast cancer. This way the study group receiving the mammograms, and the control group not receiving the mammograms, will be as equal as humanly possible. Blinded: While not likely in this type of study, the best control group would do everything the study group does except get mammograms. A clever sham for the control group, would be to use mammogram machine, have it make a noise like a mammogram was done, but not use any radiation. No mammogram would be taken, but it would not be possible for the patient, and in some cases, even the mammogram technologist to know if a real mammogram was done. This way, if there was some other factor in the mammogram room that caused breast cancer, like the paint on the wall, that increased the risk of breast cancer, the exposure would be the same. Blinding can also prevent investigator bias. For example, if an investigator was truly convinced that there was a benefit to treatment, they would be less likely to allow someone with a family history of breast cancer to go into the control group and not receive treatment. So the above study would have to run ten years to provide mammograms for the women from age 40 to 49, and to provide no mammograms for the control group. Then data will need to continue to be collected throughout every participants life to see if there was a benefit. Were tumors found sooner? Smaller? Once the diagnosis was made was the treatment for breast cancer easier? More effective? How many had recurrences? Were recurrences local, or were the recurrences to other organs like the lungs, liver, brain or bone? Did patients live longer in the screened group? The main question is, did fewer women in the screened group die of breast cancer? It might take 50 or 60 years to get the final results, and it would be very expensive to run this test. As a result, this type of testing, even though ideal, is never done. Often, new treatment protocols are unblinded early for ethical reasons. A separate group of investigators may be asked to review the unblinded results. This prevents bad treatments from doing more harm, and prevents good treatments from being withheld from the control group. It is very important to keep the above principles in mind when reviewing data. Unblinded results can be dangerous if the investigator has a bias. Recent developments in the vaccine and autism controversy come to mind. It is important to remember that risk is always relative. Risks that occur often, but cause small problems may be acceptable. A cream that causes temporary burning, but clears a rash is acceptable. Even terrible consequences may be acceptable if they are very rare. An antibiotic that clears a particularly difficult and dangerous infection 99% of the time, but can lead to liver failure and death in 1 in a million treated with it, would be acceptable if they had a better chance of dying without the antibiotic. The evening news is not the best place to get medical information. While many reports are fair, most are sensationalized. Increased drama equals increased viewership, and that leads to more advertising dollars. The motivation to inform is in all reporters and producers, but if the story is not interesting, it will never air. So in 2011, doctors are still recommending screening mammograms, beginning at age 40. For women with a family history of breast cancer developing at a young age, earlier screening may be recommended. The study by the American College of Radiology (ACR), is much more thoughtful, and certainly more objective, than the US Preventative Service Task Force (USPSTF) recommendations. But you won’t see the same prime time news coverage tonight for the ACR paper that we did in 2009 when the USPSTF made their announcement. The results are not as … interesting.